This double-live recording from the only polka band sponsored by Jagermeister includes both tunes (Grandparent's Polka and Here Is Fritz's Polka Band) that appeared during season four of the hit cable TV show, Breaking Bad! Jagermeister-sponsored, Fritz's Polka Band (FPB) was formed in 1978 by lead accordionist, the late Fred Scherz Sr., and his eight-year old son, Fritz, for whom the band was named. Sadly, Fred passed away on November 14, 2009, but FPB has vowed to carry on his legacy! Playing everything from modern-style polka to country to rock and even blues, FPB performs an eclectic mix of musical styles! FPB is NOT an oompa pa band or the stereotypical "polka" band. In fact, FPB is known for breaking the “polka” stereotype. 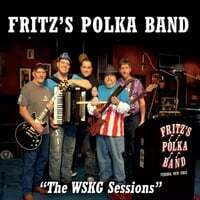 FPB is the first polka band to perform at a Woodstock Festival (Woodstock ’99)! On October 7, 2010, FPB was inducted into the Syracuse Area Music Hall of Fame! Additionally, Fritz's Polka Band has shared the stage with Sean Kingston, New Boyz, Jimmy Sturr (Grammy winner), and BeauSoleil (Grammy winner), to name a few. FPB has played at: Woodstock '99, the New York State Fair, regional and county fairs, ethnic events, colleges, concerts, social occasions, corporate events, weddings, anniversaries, and benefits.